One minute I’m totally fine and then an hour later my shin hurts to the point that it’s hard to drive. Then next day I’m in the MRI machine and an hour later the doctor tells me that my bone is having a stress response. I’m supposed to be feeling lucky because I caught it before the bone actually fractured. I do feel lucky. If it was a stress fracture I could kiss Ironman Florida good-bye. This is basically a bone bruise which translates into wearing a boot for a couple of weeks and hoping that it calms down sooner rather than later. No biking for the next week or two. No running for another week or two after that. Ironman Florida is less then 10 weeks away, with the peak phase of training starting this week. It looks like I won’t be able to race my half iron on September 9th. This is a problem. A couple of years ago, my husband told me about a game in which you summed up your partner with one word. It’s a tough game. I thought about it and decided that the word that best described my husband was “curious.” I still think that is the right word for him. His word for me was “persistent.” When I asked if that was a nice way of saying I was a nag, he laughed but he was politically correct and said no. He knows that once I set my mind to something, I am not easily deterred. I am like a dog with a bone and will keep at whatever it is, even if it means that I am annoying, which I’m sure I am on a regular basis. 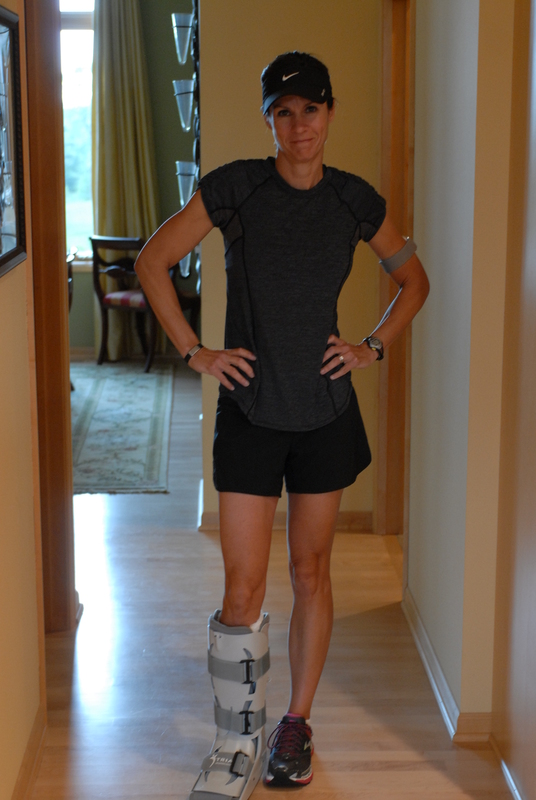 So here I am with an air cast, less than 1o weeks away from a race that is likely to pound my legs for 17 hours. I’ve had a lot of different feelings about the whole thing. I was disappointed. Frustrated. It hurts. I was worried. What am I going to do? I’m going to WORK THE PROBLEM. That is my new mantra. Work the problem. I have trained for 20 weeks, changed my diet, and given up diet soda. I have squeezed workouts in around my kids’ schedules, and I have drug my bike halfway across the country to train on vacation. It’s been a year of training and planning. I may have gotten a kick in the shin but I’m not giving up. One of my favorite quotes is from Eunice Shriver, “If you never fail, you’re not trying hard enough.” I may fail and not make it to the start line. I may fail and not make it to the finish. But no one is going to say that I’m not trying hard enough. If there is one thing I am, it’s persistent. I’ve got a great doctor on my team and my family is helping me as I hobble around in my boot. All of my workouts have been transferred to the pool. Every minute that I should be running or biking is now spent aqua jogging in the pool which means I’m shriveled like a prune for a good portion of each day. I’m lifting weights every other day. I’ve been reading other’s stories about training with a stress fracture and am encouraged by what I’ve found. I’m a solid believer in positive thinking and that the mind follows action. Smile and you will be happier. If I’m feeling disappointed, I tell myself to knock it off and think about the positive, not the least of which is that I’m otherwise healthy and can still do some effective training. Persistence. Work the problem. Don’t be afraid to fail. Smile. Sorry to hear about your shin….BUT I think you are working the problem brillantly. You may not think this, but 10 weeks is still a long time. Eight weeks (until you can bike again) is still lot of time. Six weeks (until you can run again) is time. You have a great base built. You are so strong this year, it is incredible. You have a great attitude and solid mental stuff that will carry you through. You may not be able to qualify for Kona at your first Ironman, but you will definitely be at the start line and you will definitely, definitely finish it. Hang in there and hope to see you soon. Beth, you are a strong, courageous woman with a positive attittude. I am sending you tons of positive vibes. You can do this. And we may not appreciate this enough, but every step backward will teach you a great deal about yourself and will make you a smarter, better person. I have so much respect and admiration for you, and don’t doubt for a second that you will do what you set your mind to. So sorry to read this Beth! That said, if there’s one quality you need to overcome this, it’s persistence and you’ve got that in spades. I was in the pool pre-Boston 2010 for 6 weeks with an achilles issue. I ran the race painfree maybe 10 minutes slower than I would have without the setback. For tempo runs I pick up the pace but wear the belt and so on. I find that if I’m pool running properly (with enough intensity) I’ll feel less fresh on the bike. You can do this! Wishing you all the best! Always so inspiring to read your blog… your joys, your challenges… your victories and yes, your persistence. With huge cheers and congratulations and blessings always! I am very very sorry, I understand very well your feeling. However I am sure you can manage this period with a solid cross-training. A big hug and I am glad to see that you never give up. What a shame, but you have a great attitude! I have stood at the start of a marathon after taking some time off for injury wondering if I’d be able to run even one mile and then finished the race without a problem. Heal quickly! So sorry to hear about this. I always love your perspective, even with hardships that come into your life. You inspire me.